Minn. Stat. § 216B.2425, subd. 7, states that in the Biennial Report the utilities shall address necessary transmission upgrades to support development of renewable energy resources required to meet upcoming Renewable Energy Standard milestones. In its May 30, 2008, Order approving the 2007 Biennial Report and Renewable Energy Standards Report, the Commission said, “Future biennial transmission projects reports shall incorporate and address transmission issues related to meeting the standards and milestones of the new renewable energy standards enacted at Minn. Laws 2007, ch. 3.” In its May 27, 2016, Order approving the 2015 Report, the Commission said that the 2017 Report should include content similar to the 2015 Report. Accordingly, in this Report, as in past years, the utilities are reporting on their best estimates for how much renewable generation will be required in future years and what efforts are underway to ensure that adequate transmission will be available to transmit that energy to the necessary market areas. A Gap Analysis is provided to illustrate the amount of renewable generation that is already available and how much will be required in the future to meet the standard. The narrative in this chapter is identical in many respects to the narrative and explanations provided in the 2015 Report but all figures and charts and tables have been updated since those provided two years ago. It should be pointed out, as was done in previous reports, that the utilities that are required to submit the Biennial Transmission Projects Report are not identical to those that are required to meet the Renewable Energy Standards. The information in this chapter reflects the work of all the utilities that are required to meet RES milestones, regardless of whether they own transmission lines and are required to participate in the Biennial Report. A list of those utilities participating in the Biennial Transmission Projects Report can be found in Chapter 2.0. The utilities participating in this part of the 2017 Biennial Report on renewable energy are the following. The utilities have continued to make substantial progress with respect to meeting future RES milestones. The RES milestone for 2016 – 17% renewables for all utilities except Xcel Energy, for which the standard is 25% - was achieved and is presently being achieved. The CapX Group 1 projects were crucial to meeting the 2016 Minnesota RES and non-Minnesota RES milestones. The utilities recognize that additional transmission and generation will be necessary for 2020 and beyond in Minnesota, and that other demands for renewable energy will impact Minnesota's compliance status. In addition, the utilities have provided a Gap Analysis regarding compliance with the upcoming 2020 Solar Energy Standard in Section 8.6 as well. A Gap Analysis is an estimate of how many more megawatts of renewable generating capacity a utility expects to need beyond what is presently available to obtain the required amount of renewable energy that must come from renewable sources at a particular time in the future. A Gap Analysis is not an exercise intended to verify the validity of forecasted energy sales and associated capacity needs. It is done for transmission planning purposes only. This is the sixth time the utilities have prepared a Gap Analysis; a Gap Analysis was prepared for the 2007, 2009, 2011, 2013 and 2015 Biennial Reports also. 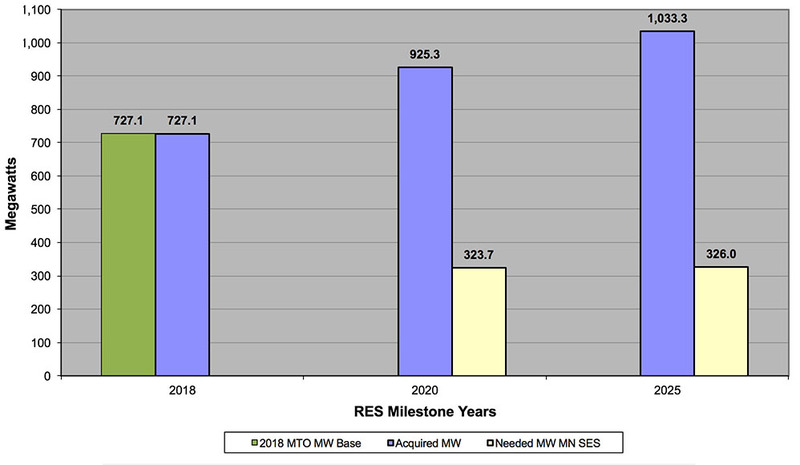 The chart below presents a system-wide overview of existing capacity in 2017 (used as a base figure throughout the various milestone periods) and forecasted renewable capacity requirements to meet Minnesota RES as well as non-Minnesota RES/REO needs. Each utility provided its own forecast of Minnesota RES and non-Minnesota RES/REO renewable energy needs, and converted such estimates into capacity based on their own mix of renewable resources (wind, biomass, hydropower) using the most appropriate capacity factors unique to their specific generating resources. 2018 MTO MW Base: RES capacity acquired, actually installed and operational ("in the ground and running") regardless of geographic location. Does not include projects under contract but not yet under construction, and it does not include projects under construction but not yet completed. 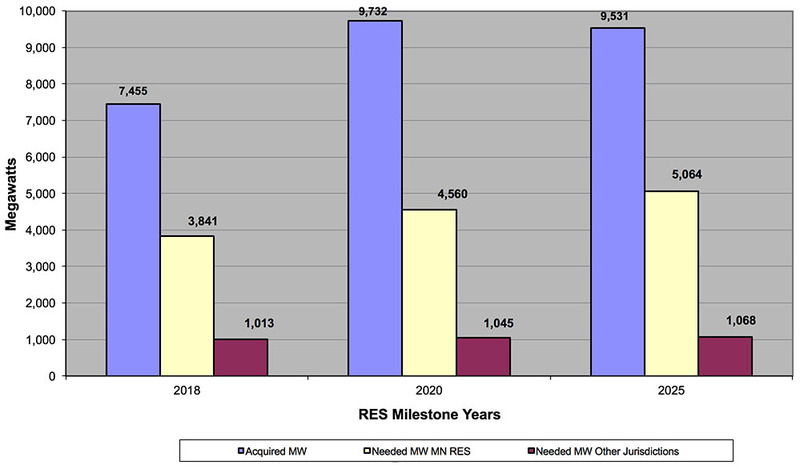 Needed MW MN RES: Renewable capacity required to meet the RES energy goals for each utility serving customers in Minnesota. Needed MW Other Jurisdictions: Gross non-MN renewable capacity required to meet RES requirements or REO goals in states served by the reporting utility other than Minnesota. Table 1 below shows a more specific breakdown of each utility's Minnesota RES and non-Minnesota RES/REO needed capacity forecast. 1. Capacity factor assumptions established by each utility. 2. These quantities include Basin Electric Power Cooperative, L&O Power Cooperative, and East River Electric Power Cooperative. This chart presents a system-wide overview of additional renewable capacity that will be acquired by individual utilities beginning in 2018 and capacity that will expire between 2020 and 2025. Such losses are attributable primarily to the expiration of various power purchase agreements for renewable energy generation. 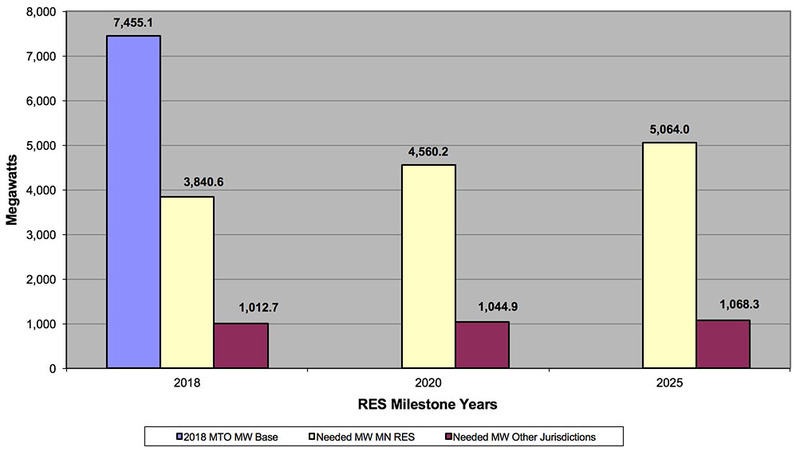 This chart represents the total renewable capacity system-wide that will be acquired and lost between 2018 and 2025, as well as the total Minnesota RES and non-Minnesota RES/REO needs between 2018 and 2025. As can be seen, the Minnesota RES utilities have sufficient capacity acquired to meet the Minnesota RES needs through 2025. When considering the RES needs, including other jurisdictions outside of Minnesota, the Minnesota RES utilities have enough capacity to meet RES needs beyond 2020. In addition, some utilities with less than sufficient capacity to meet the Minnesota RES need may use renewable energy credits to fulfill their requirement. Focusing back on just Minnesota RES needs, Table 2 below provides a more specific breakdown of each utility's forecast. 3. Some utilities with less than sufficient capacity to meet the MN RES need may use renewable energy credits to fulfill their requirement. 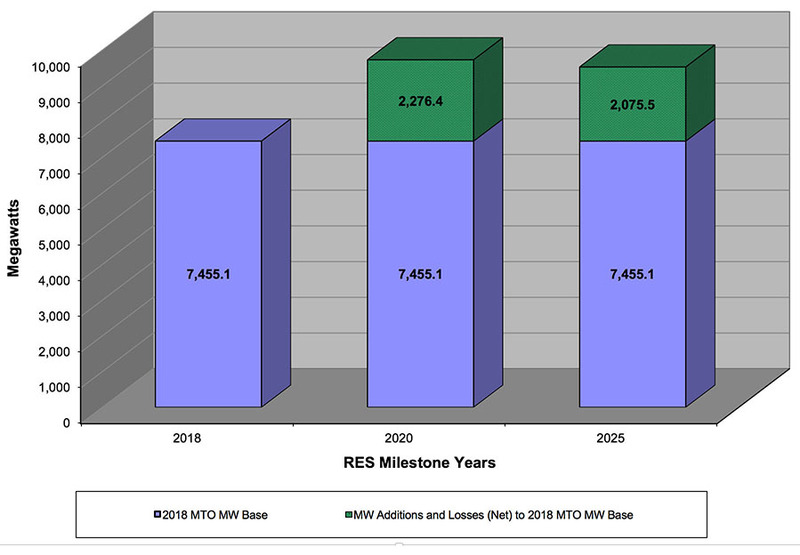 Note that the "Needed MW MN RES" bar in the bar chart in this section represents the total level of RES need in Minnesota. Conversely, the column in Table 2 that is labeled "MN RES Net" represents the additional RES capacity that is presently identified to meet RES need (a negative value means the utility has a surplus of RES capacity). The shortfall, or "gap", between MN RES need and the additional RES capacity identified points to the need for some utilities to seek additional renewable capacity and when they need to do so. Alternatively, some utilities may use renewable energy credits to fulfill their RES requirements. In 2013, the Minnesota Legislature established a separate solar standard for public utilities, effective by the end of 2020. Minn. Laws 2013, Ch. 85, § 3, codified at Minn. Stat. § 216B.1691, subd. 2f (Solar energy standard). That statute requires public utilities subject to the solar standard to report to the Public Utilities Commission on July 1, 2014, and each July thereafter, on progress in achieving the standard. In the 2013 Biennial Report, even though the first report was not due until 2014, Northern States Power Company provided a brief analysis of its anticipated needs for solar energy in future years. The first solar energy reports required under the statute were filed in May or June 2014 and the Public Utilities Commission accepted these filings in an Order dated October 23, 2014. MPUC Docket No. E999/M-14-321. The second reports were filed in summer 2015 and were approved by the Commission on October 28, 2015. MPUC Docket No. E999/M-15-462. Readers are referred to those dockets for more information about the utilities' progress in meeting the upcoming Solar Energy Standard. Because this Chapter 8 of the Biennial Report discusses utilities' compliance with Minnesota Renewable Energy Standards, however, a brief summary regarding the status of compliance with the 2020 Solar Energy Standard is included below. Utilities will continue to file annual reports until 2020 as required by the statute and directed by the Commission. Table 3 shows a more specific breakdown of each utility's Minnesota SES and non-Minnesota SES needed capacity forecast. 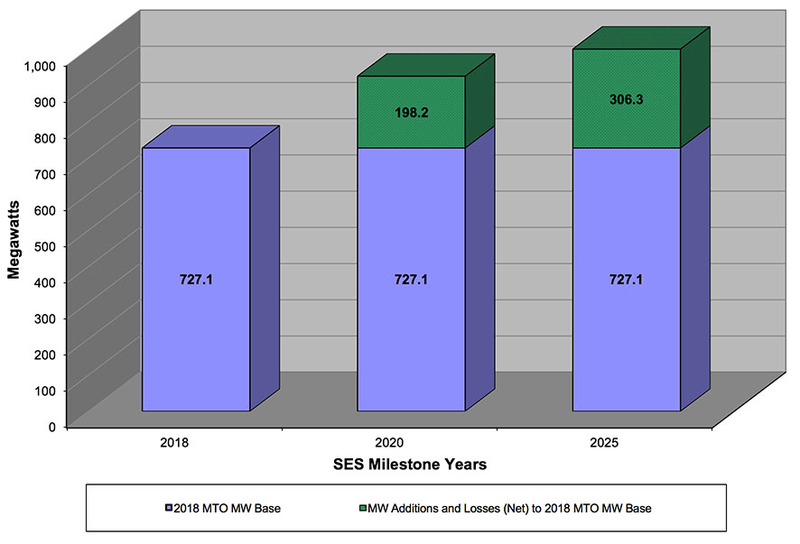 Note: SES is the MN Solar Energy Standard which will require additional solar beyond the MN RES. Table 4 below Provides MN Utilities planned level of solar capacity additions.